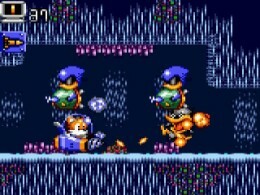 Released in 1995, Tails Adventure was one of the final big name releases for the Game Gear. With the Saturn and PlayStation on the horizon, and Pokémon causing a stir on Game Boy, most people had already considered Sega’s battery draining beast to be way past its prime. We think it’s fair to say that even Sega’s early Sonic fans overlooked it first time round. This makes it a perfect candidate for a Virtual Console release, and thanks to the 3DS’s razor sharp screen the visuals haven’t aged as badly as we feared. If anything it’s only now – some 18 years on – that we can really appreciate the effort Sega put into it. Tails is very well drawn and full of character, although the flying fox would have undeniably benefited from a few more frames of animation, while the colour palette is somewhat gentler than you may expect. The opening level is a good example of how subdued the backdrops are – a forest that has been set ablaze by armour-clad ducks that have come to terrorise Tails’ vacation. Dark caves, rocky mountain ranges and emerald-green underwater labyrinths make up the majority of the other levels, with splashes of bright colour provided in the form of the moderately entertaining underwater shooting stages. Bosses too are colourful, in both senses of the word, mostly involving the daft looking ducks in various mech-suits. You can forget all about sprinting at high speeds and spinning around loop-the-loops altogether though. The pace is much slower than any of the Sonic games due to a focus on backtracking and using objects to overcome obstacles. Four items are accessible at once from an inventory, and when not in use they’re stored back at Tails’ lab which can be visited between levels. 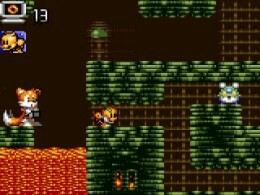 This emphasis on puzzle solving draws some comparisons to the Metroid series, especially when you consider Tails has to defeat enemies and blow walls apart by using various types of bombs. There’s also a little radio controlled flying robot – which resembles something from Batteries Not Included – that has to be used to squeeze through small gaps, while later night vision goggles and napalm bombs have to be found in the maze-like levels and used accordingly. It’s quite a clever little game that requires both exploration and patience. Quite astonishing really when you take into consideration that most of the handheld’s releases were aimed at younger gamers. Some signposting wouldn’t have gone amiss however – if you miss an item of importance you simply have to backtrack and revisit levels until you find what you’re looking for. We even had to resort to a guide on GameFAQs at one point. Even the health system is different to that of previous Sonic games. The iconic golden rings still feature but instead of floating in thin air they’re hidden inside breakable walls and are randomly dished out when enemies are blown to bits. 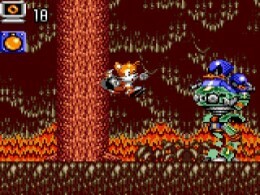 Every time Tails takes a hit one or two rings are knocked off the total, while falling into lava or onto spikes takes away a significantly higher amount. It’s a strange set-up as you start out with just 10 rings, which makes the first few levels rather tricky, but as the game goes on so many are eventually acquired that you don’t have to worry about taking a few hits now and then. When down to just a few rings we did often panic – one life is all you get. Thankfully though the Virtual Console’s facility to save anywhere has rendered the original password system somewhat redundant, and because it’s now possible to save as you please the overall experience is nowhere near frustrating as it was in 1995. A game made better by modern technology, if you will. It’ll probably still cause some teeth grinding, but at least at the end of it all you’ll be able to say you experienced one of the most intriguing – not to mention occasionally downright bizarre – adventures the Game Gear had to offer.